I can’t imagine another adventure like this – bathing in the heart of volcano. It’s an amazing experience that keeps you soaked by emotions, dunked in the nature’s deepest secrets and inexplicable power. Sounds a bit mysterious, but at the same time thrilling. For a restless traveler like me, being at the heart of volcano and having a bath in there, is a lifetime memory, which I’d probably renew and rebuild one day. When I went to this remarkable place, located in Pirin mountains, Bulgaria, I had no clue I am stepping in a volcano chimney. I know, I know what you are going to say right now! You have never heard about a volcano in Bulgaria, neither in Southeast Europe? You’d expectedly object it – the only active volcano in this part of Europe is Etna on Sicily island, Italy. Well…almost correct, but I am either so. Let me tell you the complete story and the mystery will be finally revealed. I promise you, it’s worth it and makes it kind of a fairytale. This miraculous spot is called Kozhuh Planina (fur-coat mountain), because its outlines really resemble a fur-coat. It’s just 12 km away from Greek-Bulgarian border, thrown deep in between the mountains. Kozhuh could be hardly considered a mountain though, because it’s only 280 m high. The legend tells a story that a million years ago Kozhuh was a very active and a petrifying volcano, far not extinct, but just sleeping, waiting for a sign to wake up and erupt again with new power. 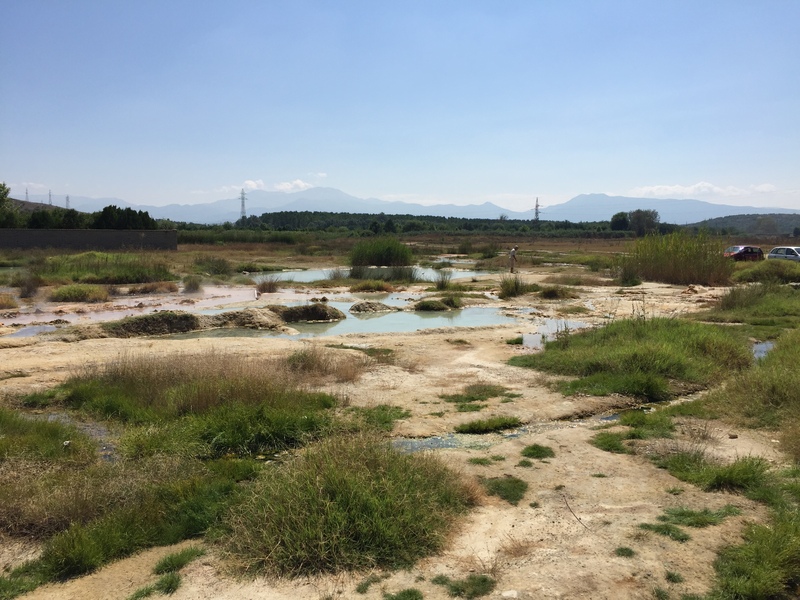 I’ve been told the most horrifying earthquakes in this area (called Rupite) were believed to come deep from the Earth core, just because of that sleeping volcano. The forecast is for another potential earthquake with possible magnitude 8 to 9 by Richter scale, which is really shocking. A catastrophic earthquake with similar magnitude has already destroyed the nearby habitats in the very beginning of the 20th century. Then it has been measured close to 8 by Richter. The scientists and the locals believe, it’s just a matter of time another monstrous earthquake to hit the mountain. And at the bottom of the cataclysm, they point out to be the sleeping Kozhuh volcano. To be honest it doesn’t seem like a real volcano. At least not like that one, we are used to watch on National Geographic documentaries – gigantic, sharp edges, deep chimney…nothing like that in here. When I arrived, I saw just a broad, flat valley, covered by naturally boiling mineral springs, surrounded by hills. Hills, not mountains. The big attraction here are the hot thermal springs, whose uniqueness and health effects attract many tourists all year round. At first sight, they look muddy, with a questionable hygiene and possibly some invisible creatures underneath. But it’s just the first impression. I have been convinced, such a high quality, with proven effects of thermal spring water could be found only in the famous German resort Baden Baden. So phenomenal and special the healing mineral water in Rupite is. It springs deep from the Earth core. Its natural temperature reaches 75°C. 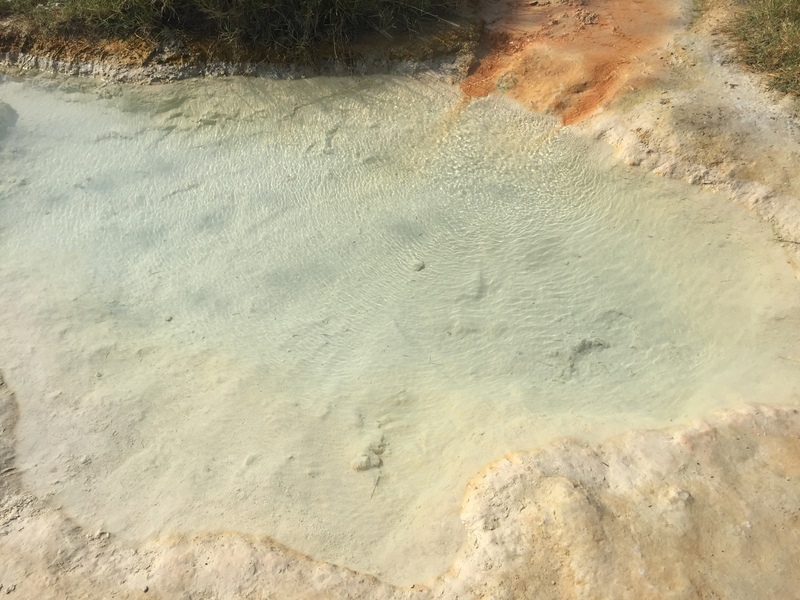 The small natural mineral lakes have actually different temperature, that could be controlled by letting the water flow in between the linked basins. Could be actually dangerous, if you are coming for a first time and stupidly jump directly into the steaming water. I was warned, if I do that, my body would be literally boiled and the end could be sadly lethal. The best advice I got is to primarily look around and to check what basin visitors already lay in. Usually the ‘bathers” are split in different water-cells with varying levels of temperature. I have never heard about those healing springs before and was surprised they were actually so popular. Have met here, while laying in the basins, newcomers from Greece, Russia, Germany, Austria, Turkey and Poland. 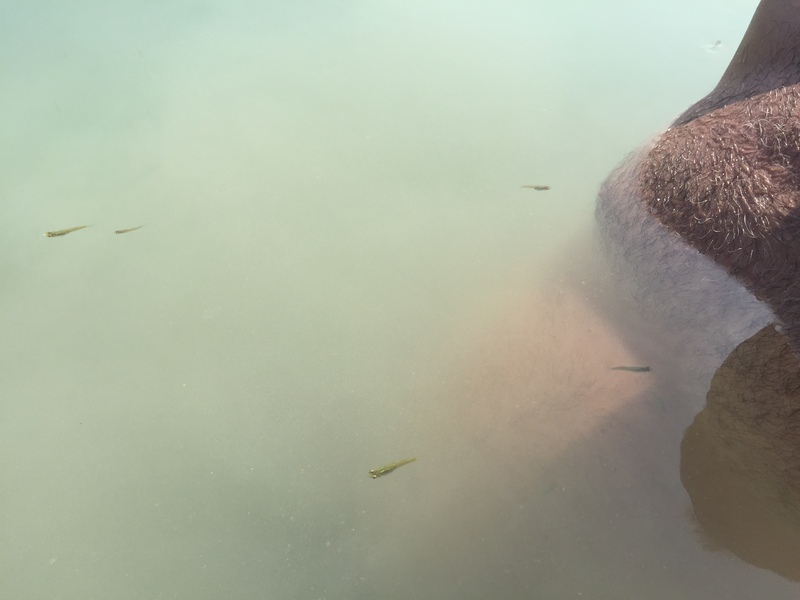 That’s the other advantage – those healing thermal springs are free of charge, so you are treating your body by health complimentary, which cannot be found anywhere else. Speaking about health…there is an explanation of the mineral water health effects, written over the nearby banners, but it’s only in Bulgarian language. 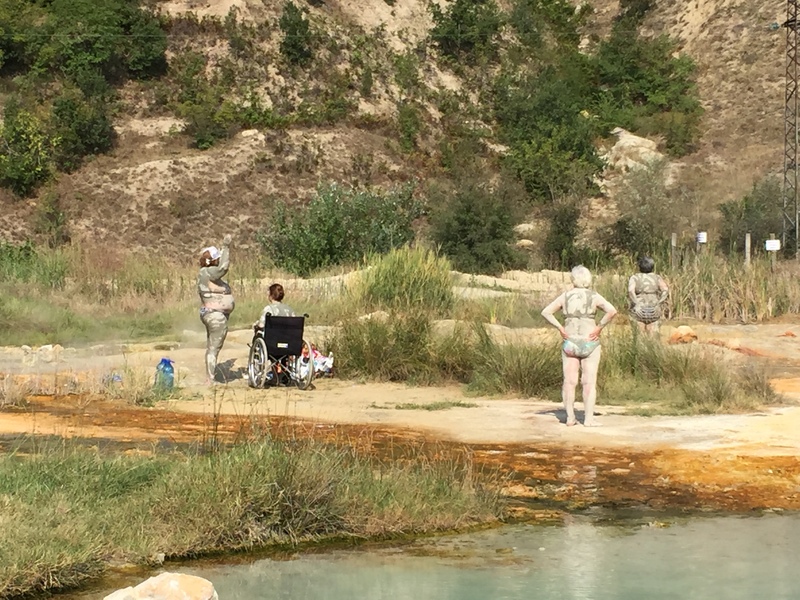 The native locals are extremely proud of their thermal springs, very friendly and ready to provide any info. Laying underneath the water, I was curious to locate where Kohzuh Planina is (the sinister volcano I mentioned above). I asked my neighbour by spring basin, does she know where is it. She raised her hand and simply pointed to an ordinary, green, quite plain hill, right in front of my eyes. My spring neighbour was obviously a local and kindly invited me to come back during the winter season, when the valley is covered by heavy snow and it’s a real blessing being underneath the hot water. The usual winter air temperature here could drop to minus 10-12C, but the thermal springs keep their temperature constant, plus 75C. Isn’t it incredible? It’s such a pity I hate the snow, otherwise I would accept that invitation. Well… Now, after my self-treatment, I should admit the difference is quite invisible. But the local “experts” reassured me, two visits only were not enough and that way I am going to achieve nothing. Probably, it was my fault, greasing the sulphur mud only twice on my face. My short experience obviously could not be a real indicator for the healing power of the water and the clay. You should know something even more important. Whatever issue your bones may have, even if you are not aware of, the hot thermal water will bring it to light. For example, I do have pain in my shoulder time to time, but I keep ignoring it. After 30 minutes in the basin, I already felt that pain much stronger. I did not believe it, but the thermal water sharpens the bone problem and reveals it. After approximately an hour in the water, you start feeling slight stabbing at the problematic area. Then it turns to an annoying unpleasant swirl or “digging”. The hot water actually gives you a diagnose for free. The frequent visitors claim, at least 5 baths are necessary to start healing the issue. I got my diagnose, but unfortunately, I did not have time for therapy. 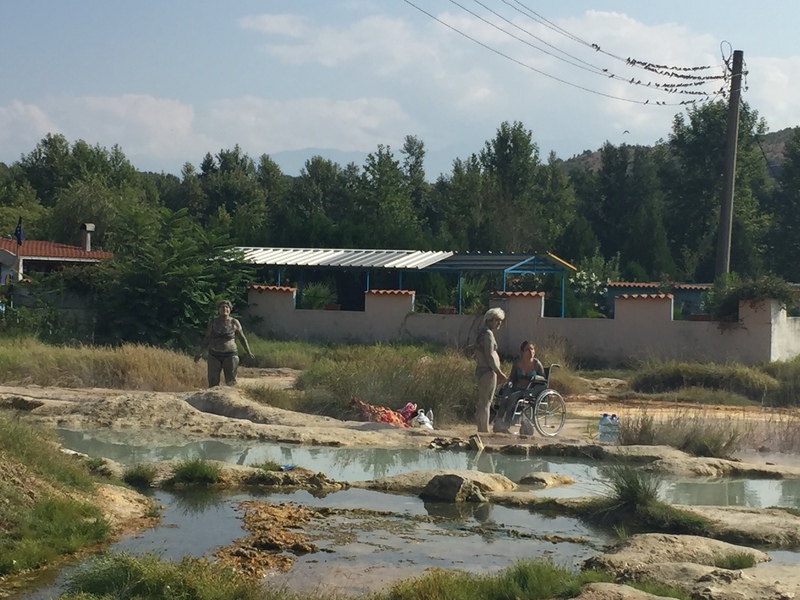 The most thrilling attraction was revealed by the coolest basin, where permanently live some kind of fish, literally eating the body’s dead skin. You know, it’s a very modern cosmetic procedure now for feet treatment, but here in Rupite, unexpectedly you get it completely free of charge. Instead of paying your feet to be soaked in an aquarium with those special fish, here in the coolest of the water-cells, you get plenty of healing fish bites complimentary. And not only over the feet, but all over the entire body, with no time limit. Such a catch:) . I tried it twice and it worked fantastically. The little fish really “eat” the skin and you can feel the gentle “bites”. It’s a very unique and hilarious experience, so I would recommend it to everyone. 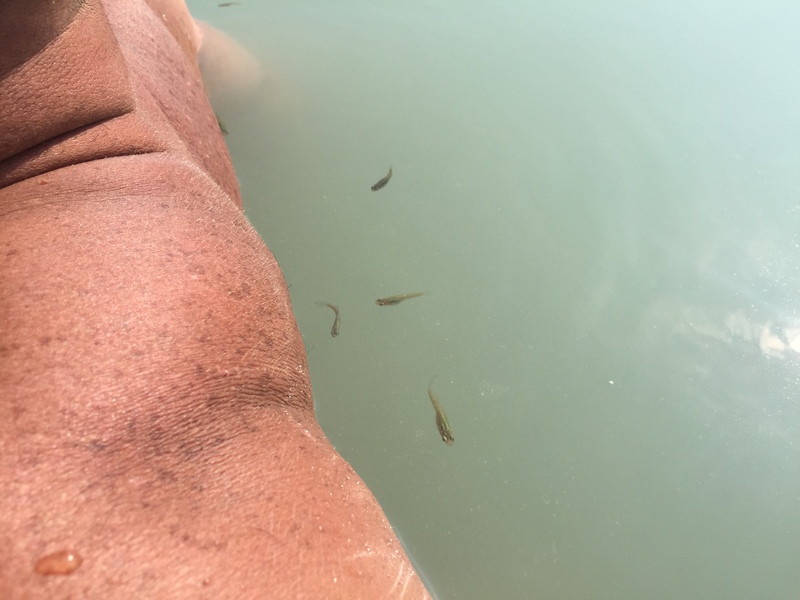 The fish somehow find where exactly your problematic skin zone is. If you are patient, they will shortly pill it off unpainfnully. Don’t jump in any of the basins, being not aware of its temperature. Really dangerous! Visit the fish coolest water-cell, it works! You don’t need any sunscreen – use the clay instead. Take as many photos as you can, with the sulphur clay on, including. And last but not least – be careful moving in between the basins. Extremely slippery, because of the underneath stones and the clay-mud!!! You can drop in a boiling water-cell. 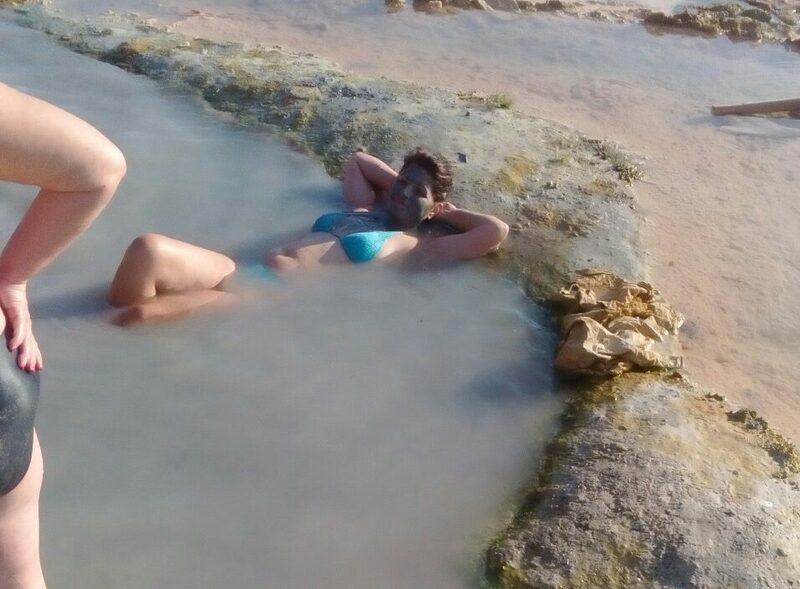 My thermal springs fairytale comes to an end. I should mention here about the bond of the famous local prophet Vanga with this place – Rupite. When she was alive, she claimed Rupite and Kozhuh Planina, both hide a great secret from the remote past. She used to say there is a special energy in this area that helps the people. “This place is very spe­cial. ‘Koz­huh’ hill embod­ies a great secret that fills me up with ener­gy. Once there was a big city in this val­ley. Its inhab­it­ants were tall, dressed in clothes made of thin and shiny as tin­foil mate­ri­al. They were very enlightened,” used to say Vanga. But this will be a subject of my next article. What has inspired me right now to share the story above, was my unforgettable experience – bathing in the heart of volcano and making a memory with every single step around.